For the Coronation garb of Queen Engelin I of Lochac, Mistress Portia Vincenzo asked me to embroider some goldwork Frankish cuffs. Mistress Portia provided me with the design, materials and references for this project. 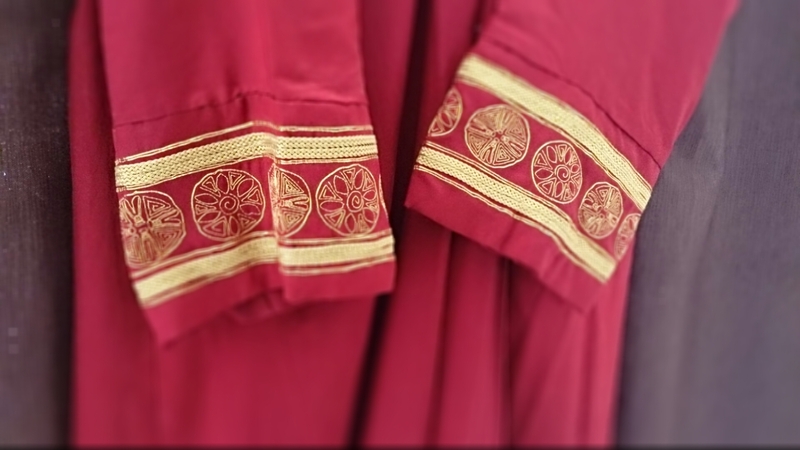 The design was adapted from extant goldwork cuffs on a silk dress worn by the Frankish Queen Arnegunde in the 6th Century. These cuffs are available online at Frankish Costume. 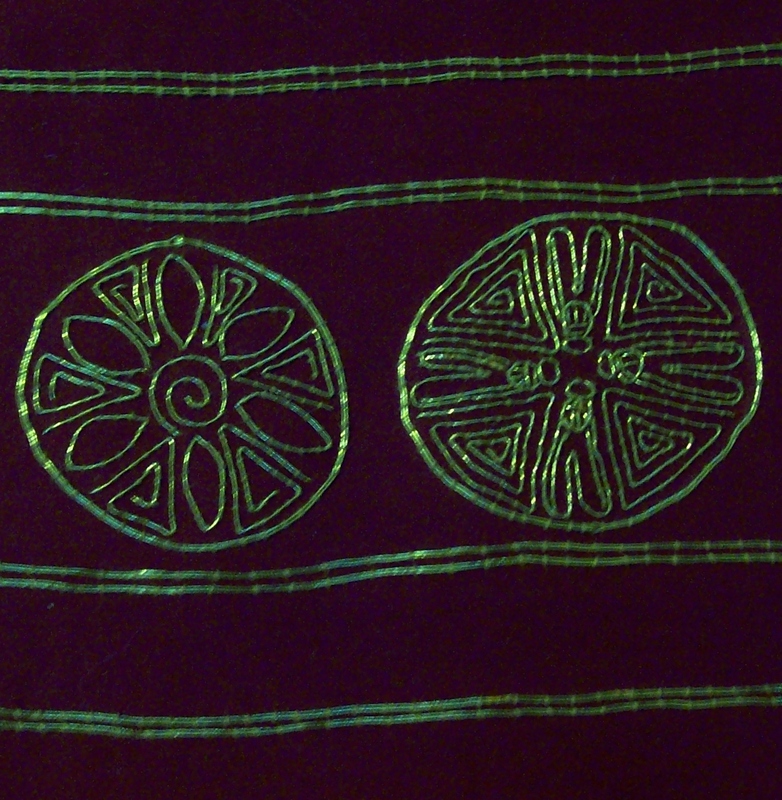 “Embroidery at the sleeve-cuff” from Frankish Queen Arnegunde, 6th Century. Another design element incorporated into the embroidery pattern were Childeric’s bees/flies. Childeric I was the Merovingian King of the Salian Franks in the 5th century and golden bees/flies were discovered in his tomb. 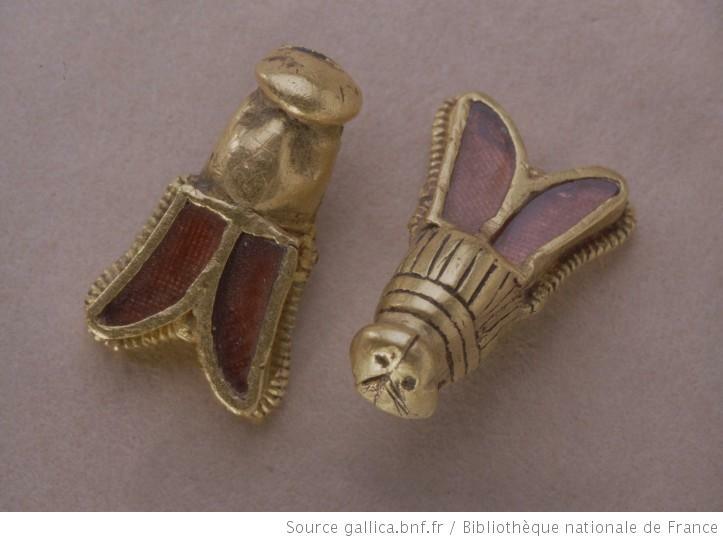 The image of Childeric’s bees (below) is published in the Bibliotheque Nationale de France (National Library of France). “Bees: The head and thorax are gold, the wings are inlaid with garnets. On the reverse, a fastener” – Bibliotheque Nationale de France. 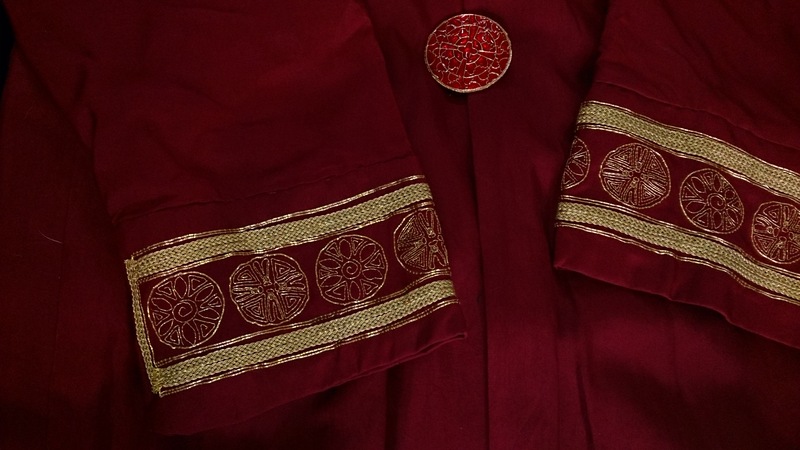 Gold jap thread was couched down in pairs onto red silk with faun-coloured silk thread. 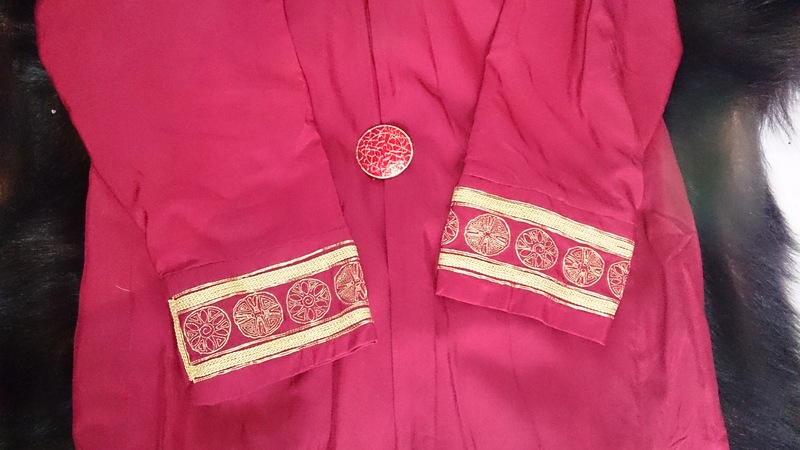 I had a lot of trouble trying to transfer the design onto the red silk because it was not transparent (and a design could, therefore, not be traced on). I was relatively new to embroidery and was not aware of the techniques I could have employed to transfer the design. For those interested, a technique for overcoming this is explored in my 2012 entry for Burbage’s Pride of Lochac project. I did not have time to resolve this issue, and so the couching was completed free-hand onto the silk. 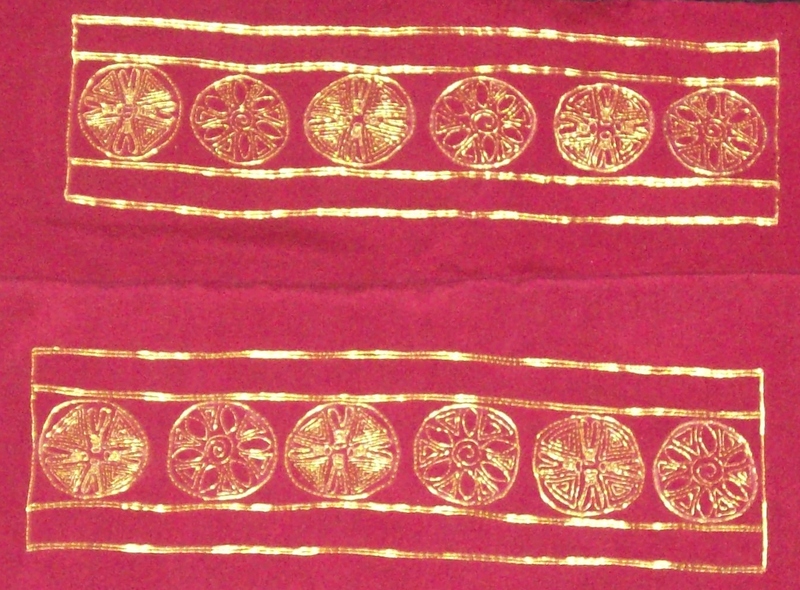 A close-up of the repeating motifs of the cuffs design; A flower in one roundel (left) and 4 bees in the other (right). I found it difficult to keep the embroidery neat and straight. This was because the silk was very slippery, and so too was the gold thread. Together, they had little friction. Even after the gold thread was couched down it would move. The finished cuffs for Engelin. Once the embroidery was complete, the cuffs were sent away to be sewn on to Engelin’s coronation garb. 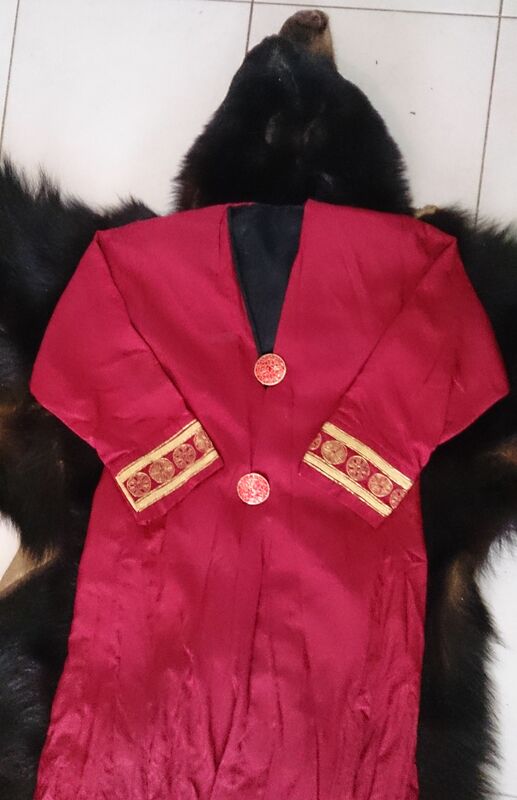 As you can see in the image below (apologies about the quality, it’s the best version I have), the cuffs are a feature point on the silk outfit. 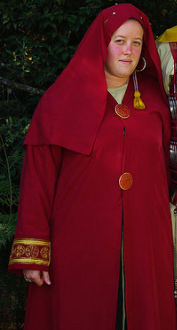 Engelin in her silk outfit with the goldwork cuffs evident. 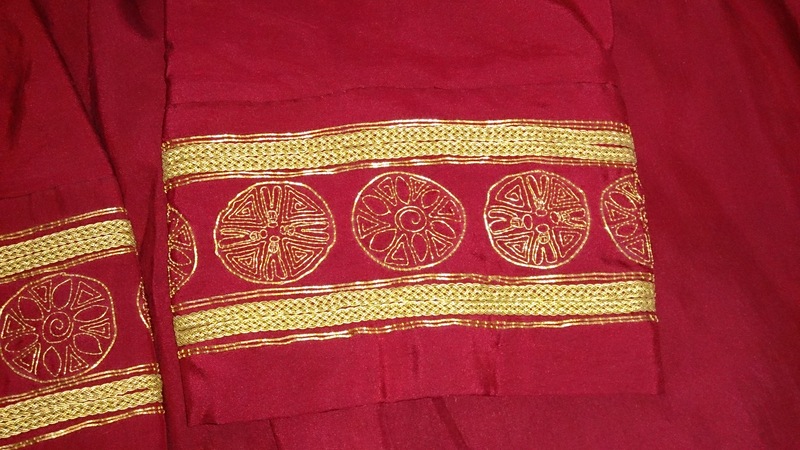 Close up of one of the cuffs. The cuffs with a more true indication of colour. The thick gold lines around the border were added by someone else, however, all of the gold thread couching was done by me. This shot hides the colours but shows the embroidery a little better. Another close up of the cuffs. The cuffs in context on the outfit. On a bear skin, because that’s just the way Engelin rolls. Frankish and Merovingian items are mentioned in Early Medieval Art by Lawrence Nees.